For nut-lovers... famous Fruit Delights with 33% more walnuts! 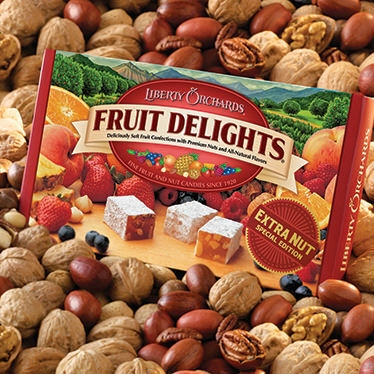 In celebration of our 90th Year Anniversary in 2010, we created a "special edition" of our Fruit Delights with one-third more nuts at no extra charge! Kosher. INGREDIENTS: Extra Nut Fruit Delights: sugar, corn syrup, nutmeats (walnuts, pecans, macadamias, cashews), modified corn starch, fruit [fruit juice from concentrate (peach, strawberry, blueberry, raspberry), candied orange peel, pineapple, raspberries], pectin (pectin, disodium diphosphate, sodium polyphosphate, dextrose, dicalcium phosphate), natural flavors, sodium citrate, citric acid, malic acid, soy lecithin. I received a box of the Fruit Delights as a gift which were supposedly with extra nuts. However, we did not notice that there was any difference from the regular ones. After speaking with one of your representatives, she kindly shipped me another box, but again we could not tell that it had extra nuts. For my taste, I think you will need to add more nuts if you're going to refer to it as "extra nuts," as it still does not seem to have enough. Liberty Orchards Reply: Laurie... Thank you for your feedback. 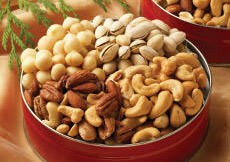 We're sorry that there weren't enough extra nuts in the product you received. We're surprised to hear this, because we assure you that we increased the amount of nuts added to each "extra nut" batch by 33%. In fact, the increased amount made it more difficult for us to mix them in well, and maybe that was the problem. Possibly, there were parts of the batch that didn't get enough of the extra nuts due to inadequate mixing. We'll look into that. Thanks, again. The extra nuts was the 'icing on the cake'! They will definitely be ordered again, next time. my husband was very happy you now have extra nuts, I gave him a box for Christmas. This is some good candy! Wow! I thought the Aplets and Cotlets were the ONLY candy. Now thanks to the free candy with order, we are totally addicted! Really satisfies the sweet tooth! Very Tasty!